This salad turned out better than I thought it would. I received some purple radishes in my Full Circle box last week. I usually just slice them and put them on a salad but thought I would do something a little different this time by making the radish the star of the salad. This salad has a lot of crunch and as you can see, very colorful. The best part is that it's so easy to make, especially if you have a mandoline. I have one of these Japanese Mandolines. I have to admit I don't use it that often since I don't usually slice large amounts of things but if you occasionally have a lot of slicing to do it is well worth having one. 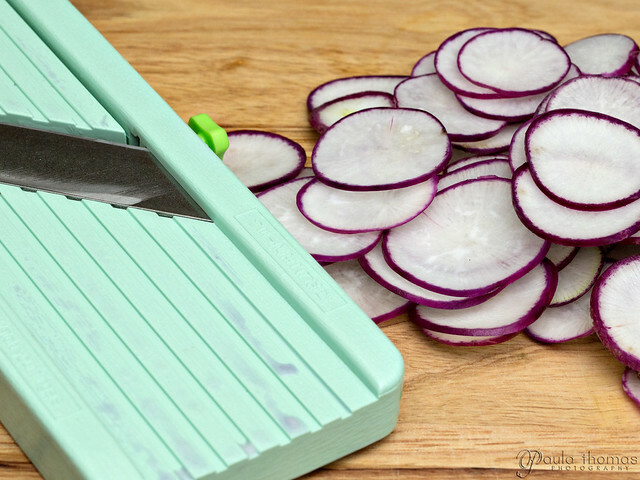 I sliced the carrots, radishes and shallot with it and it took no time at all. Add sliced carrots, radishes and diced shallot to a medium sized bowl and set aside. Zest and juice the lime and add to a small bowl with the oil and salt. Wisk until well combined. 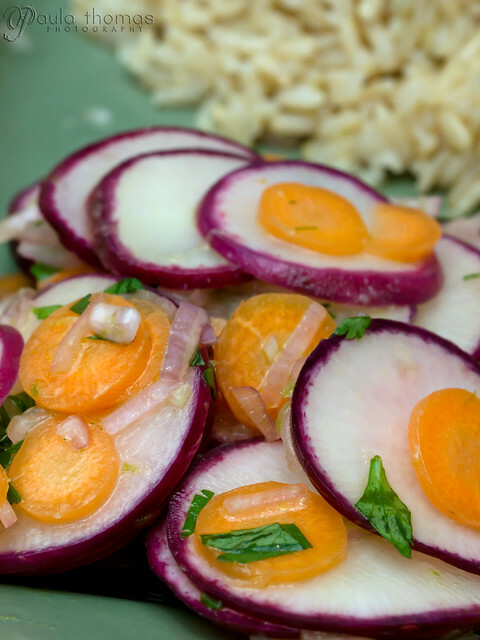 Pour the lime mixture over the carrots, radishes and shallot and toss until well coated. Stir in the cilantro and chill in fridge to let the flavors meld for at least 15 minutes. It's best eaten within a few hours of making. The longer it sits the more juice will drain out of the vegetables and you will end up with a puddle of juice at the bottom of the bowl.